The Panacea for Protecting Trout? There are many arguments about whether catch and release fishing helps to protect trout. Personally, while it is only part of what is needed, I think it is useful in helping to preserve this species. There exist detractors, though, that are not in agreement and say that to return the fish to the water is of little value. Good ideas can have all kinds of tastes sometimes. Now, while I think catch and release fishing has its benefits, I do think that it is not enough. It is not all that should be done to maintain, or better still to improve, the quality of the fish in the continental waters of Patagonia. For that, we must also think in a systemic way about the rivers, lakes and streams because these are hydro-biological systems where there exist almost an infinite number of interactions between live and inert organisms, And these interactions all contribute to sustaining a species of interest to sports fishermen like that of our much valued trout. I find it particularly interesting that up to now I have heard little in my country about the necessity of protecting all the species that inhabit the waters of Chile. I think that what must be done is to protect with the same energy both the trout and the species that they feed upon. And in turn, the species that the trout feed upon also have feed sources that must be protected. For example, there exists a species of great value for the trout in southern Chile called the peladilla, which has been greatly affected by excessive human consumption after decades of extraction. As well, the peladilla has been impacted by contamination and the dis-equilibrium caused by the escape of undesirable species from the salmon industry, which have hampered dramatically further still this species. 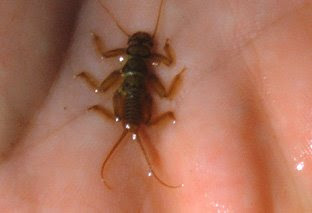 The peladillas eat all kinds of live organisms that help them with protein intake, like sub-aquatic insects, small-winged adult caddisflies or mayflies, etc. If these organisms are contaminated it causes effects on their feed sources and as a consequence, to the species itself, which ultimately leads to breaking the food chain. With exceptions of course, most rivers and lakes in the country today have a stock of all species that is well below the not-too-distant past. Reasons are several, but two are most important and are due to human actions: excessive fishing pressure and increasing industrial pollution from especially the salmon aquaculture industry. Human actions have caused a deterioration of the biomass of living organisms, both sub-aquatic flora and fauna. Human actions without doubt affect the quality and quantity of trout that can sustain a place. It is then impossible to think that only through catch and release fishing practices they could again be restored to their state of 40 or 50 years ago. In those years, the Chilean rivers and lakes had a lot of trout and of an average size that today would be impossible to imagine. Another big difference from today? There was plenty of food for them that allowed them to grow in large sizes. If you really want to restore the trout fishery to what it once was in Chile, it is essential to recover the population of the whole range of native fish and freshwater crustaceans. A solution for that is not easy, but I believe we must first begin by urgently reducing pollution of inland freshwater courses. Then, lets repopulate rivers and lakes with some of these native species, such as peladilla or pejerreyes, which are technically possible to cultivate. After all that, some day we might have fishing that could approach what it was five decades ago, but I personally think that we will never again witness anything similar. Whatever can be done, however, it must go hand in hand with more stringent environmental legislation and better methods of enforcing it. The real question is: does Chile have the will to fight for this? It is my personal experience that there are very few people who fight for these kind of values, and these same people are very lonely in a fight against windmills. Another question: will there be political will to do it? It is not easy to unite Chileans around something, but if nothing is done soon, fishing for big, beautiful trout will increasingly become more prevalent as merely a souvenir filed in photo archives of books, magazines and fisherman collections.